Unlike crystalline minerals, glazes do not have a specific melting temperature, they soften over a range of temperatures. And after they have been melted they become increasingly fluid and homogeneous. The softening process is not a linear one, this is especially so because raw glaze powders are a mix of many different mineral (and possibly man-made) particles, each of which has its own melting behavior. Flux particles melt first but not just because they are fluxes. The mere proximity of other particles with which they like to interact creates a union that melts readily at temperatures much lower than either individual one would melt on its own. These interactions are also greatly enhanced when the particles are smaller and when groups of different particles react together (the more different types and sizes there are the more complex is their interactions). And then, as viscous glass melts evolve, they develop their own changing dynamics that can accelerate or slow the dissolution of remaining larger and more refractory unmelted ones. When sufficient time is available, the entire mass is melted. However as the last particle dissolves the melt exists as a discontinuity of chemistries and viscosities (phases). Message: OnLine INSIGHTAs yet more time passes the homogeneity of the mix increases. The higher the proportion of fritted materials the more predictable the process is. That means that an individual glaze can actually serve well across a range of temperatures and can exhibit itself in a variety of ways. At one temperature it might be a matte, at another a glossy, at another a crystalline or reactive. Various firing schedules within a temperature will increase the number of personalities even more. It is thus better to see glazes as more dynamic and less easily pigeon-holed and classified. Again, the complexities of oxide interactions and firing methods along with the wide range of physical and mineralogical properties of materials supplying oxides make the prediction of absolute values for fired properties an inexact and highly system-specific science at best. Modelling this in an absolute sense (predicting exact viscosities at exact temperatures for any mix of materials) using chemistry and mathematics is not possible. Notwithstanding that, the single biggest factor affecting the degree to which we can predict what a melt will do (in a comparative way) is its chemistry. This is especially so when we keep all other factors equal. For example, if we can measure the melt fluidity at a specific temperature then we can predict whether it will melt more or less if specific changes are made in the chemistry. The certainly of that prediction will be greater when we source the chemistry from all the same materials and it will be less when we introduce new ones. Digitalfire Insight's ability to show side-by-side recipe chemistry and physics makes it a natural for studying one in relation to another with respect to melting and softening behavior. Technicians build a knowledge of what types of chemistry changes are most effective in altering melting temperature without unduly affecting other properties and how this relates to the materials that are sourcing that chemistry. With experience you will develop the ability to predict the range in which a glaze might be useful in your circumstances better than any algorithm could do. For these reasons Digitalfire has been very hesitant to build temperature prediction into our software. 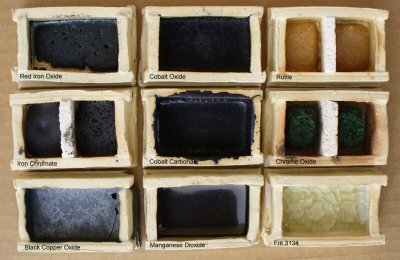 How do metal oxides compare in their degrees of melting? Metallic oxides with 50% Ferro frit 3134 in crucibles at cone 6ox. Chrome and rutile have not melted, copper and cobalt are extremely active melters. Cobalt and copper have crystallized during cooling, manganese has formed an iridescent glass. This is unlike some raw materials which melt suddenly. Feldspar and talc are both flux sources (glaze melters). But the fluxes (Na2O and MgO) within these materials need the right mix of other oxides with which to interact to vitrify or melt a mix. The feldspar does source other oxides for the Na2O to interact with, but lacks other fluxes and the proportions are not right, it is only beginning to soften at cone 6. The soda frit is already very active at cone 06! As high as cone 6, talc (the best source of MgO) shows no signs of melting activity at all. But a high MgO frit is melting beautifully at cone 06. While the frits are melting primarily because of the boron content, the Na2O and MgO have become active participants in the melting of a low temperature glass. In addition, the oxides exist in a glass matrix that is much easier to melt than the crystal matrix of the raw materials. 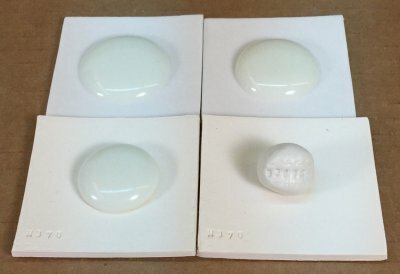 We are comparing the degree of melt fluidity (10 gram GBMF test balls melted down onto a tile) between two base clear glazes fired to cone 6 (top) and cone 1 (bottom). 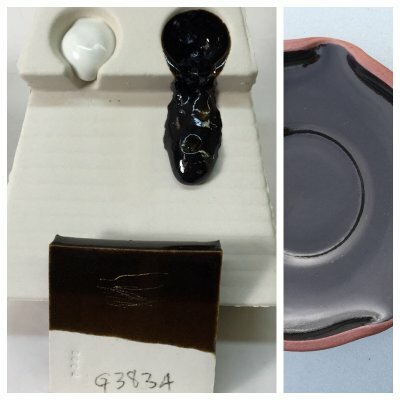 Left: G2926B clear boron-fluxed (0.33 molar) clear base glaze sold by Plainsman Clays. Right: G3814 zinc-fluxed (0.19 molar) clear base. Two things are clear: Zinc is a powerful flux (it only takes 5% in the recipe to yield the 0.19 molar). Zinc melts late: Notice that the boron-fluxed glaze is already flowing well at cone 1, whereas the zinc one has not even started. This is very good for fast fire because the unmelted glaze will pass more gases of decomposition from the body before it melts, producing fewer glaze defects. The glaze on the left is called Tenmoku Cone 6 (a popular, and old, CM recipe). It is 20% calcium carbonate, 35% Custer feldspar, 15% OM4 Ball Clay and 30% silica, 10% iron oxide. If you have any experience with glaze you will note two things that a fishy here: There is no boron, lithia or zinc sourcing material. How can this melt enough at cone 6? It looks melted, but the ease of scratching it shows it is not. So, it appears that if we saturate an incompletely melted glaze with a lot of refractory brown colorant on a dark body the effect can be black. A better idea is the glaze on the right. We start with a stable, reliable base transparent, G2926B. Then we add 5% Mason 6666 black stain (stains are smelted at high temperatures, quenched and ground, they are inert and relatively safe). A bonus is we end up with a slurry that is not nearly as messy to use and does not turn into a bucket of jelly. Can a cone 6 functional glaze having only whiting and feldspar melt enough? This flow test compares the base and base-plus-iron version of a popular CM recipe called "Tenmoku Cone 6" (20% whiting, 35% Custer feldspar, 15% Ball Clay and 30% silica, 10% iron oxide). Although iron is not a flux in oxidation, it appears to be doing exactly that here (that flow is just bubbling its way down the runway, the white one also fires to a glassy surface on ware). It looks melted in the tray on the right but notice how easily it is scratching on the tile (lower left). This demonstrates that looks can be deceiving. Cone 6 functional glazes always have some percentage of a power flux (like boron, lithia, zinc), otherwise they just do not melt into a hard glass. Maybe a glaze looks melted, but it has poor durability. A detailed discussion of the oxides and their purposes, crystallization, phase separation, thermal expansion, solubility, opacity, matteness, batching, melting. 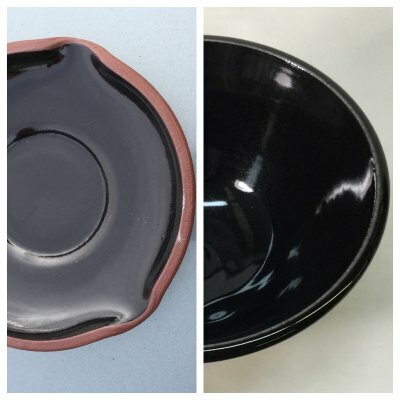 (Articles) What Determines a Glaze's Firing Temperature? By understanding how glazes melt and materials and chemistry interplay to determine behavior and temperature of melting and testing degree of melt you control the melting temperature of your glazes.